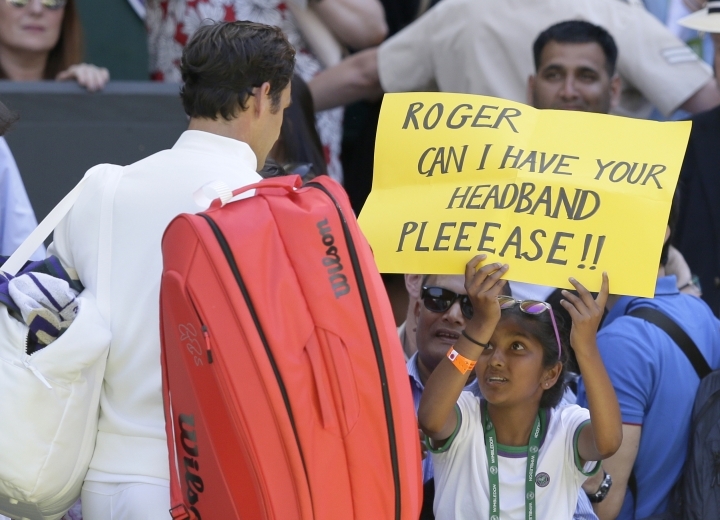 LONDON — Roger Federer didn't need his initials to sign off on another masterful display at Wimbledon. He's hoping to get them back soon, though. Federer's stylish "RF" logo was missing from his outfit as he stepped out on Centre Court on Monday to begin his title defense with a quick 6-1, 6-3, 6-4 win over Dusan Lajovic. So was the Nike swoosh that has been an ever-present adornment during his 15 years of tennis dominance. The eyebrow-raising new look was a result of switching apparel sponsors to Japanese clothing company Uniqlo, despite the Swiss star's name having been synonymous with Nike ever since winning his first Grand Slam title at Wimbledon in 2003. And while the swoosh may be gone for good, Federer wants to reclaim his initials. "Yeah, so the RF logo is with Nike at the moment, but it will come to me at some point. I hope rather sooner than later, that Nike can be nice and helpful in the process to bring it over to me," Federer said. "They are my initials. They are mine. The good thing is it's not theirs forever. In a short period of time, it will come to me." One thing that clearly hasn't left him — even at the age of 36 — is his mastery of grass courts. 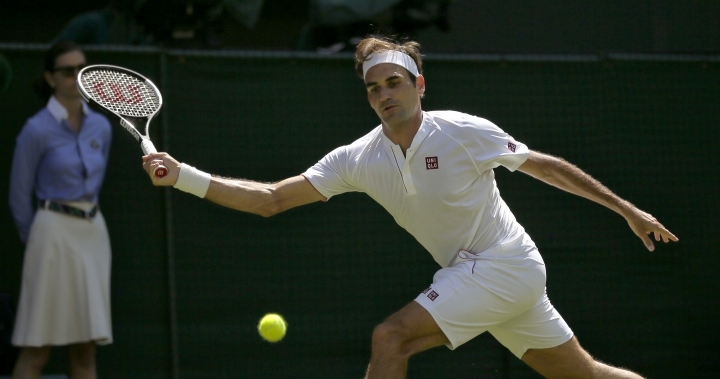 Starting his quest for a record-extending ninth Wimbledon title, Federer looked as sharp as ever. Lajovic held serve in the opening game but that was as good as it got for the 58th-ranked Serb. Federer reeled off the next nine games to take charge and was in cruise control for the rest of the match. 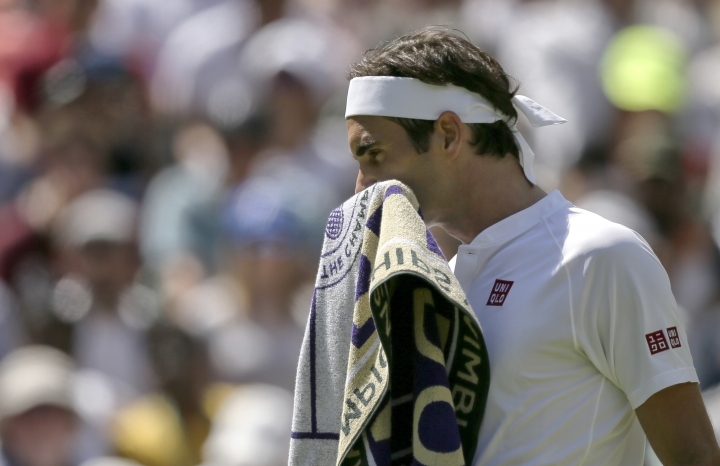 Federer didn't face a break point and showed off the full repertoire of shots that has made him the most successful male player ever at Wimbledon. He set another record in the process, becoming the first man in the Open era to play in the grass-court Grand Slam for a 20th straight year. The man he beat in last year's final, Marin Cilic, also advanced easily. The third-seeded Croatian cruised past Japanese player Yoshihito Nishioka 6-1, 6-4, 6-4. He joined No. 8 Kevin Anderson and American duo John Isner and Sam Querrey to advance in straight sets. No. 6 Grigor Dimitrov of Bulgaria was the highest-seeded man to bow out, losing to Stan Wawrinka 1-6, 7-6 (3), 7-6 (5), 6-4. Federer's move to Uniqlo had been rumored ahead of the tournament, but wasn't confirmed until he stepped onto the court. However, he hasn't completely left Nike behind. He still wore the American company's shoes on court, although he may have had to pay for these ones himself. "I don't have a shoe deal," he said. "I'm looking forward to see what shoes I will be wearing in the near future. For now, I will be wearing Nike. They have shown interest to have a shoe deal with me, as well. Ties are not broken there. I have deep roots with Nike. I've had a great relationship over the last 20 years. But everything is open."